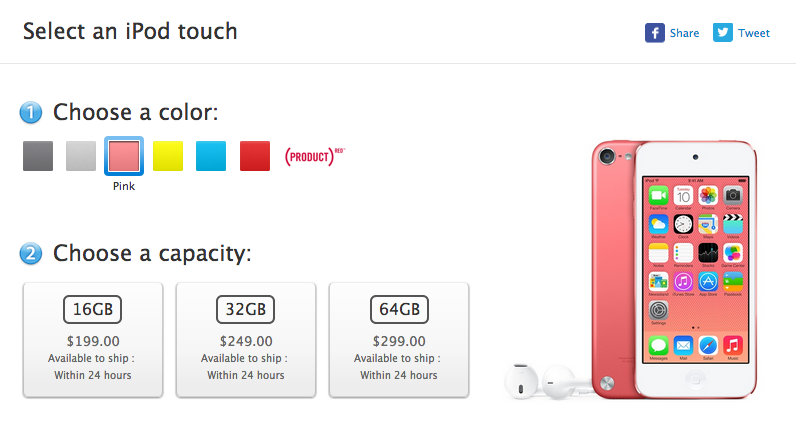 There’s a new iPod Touch available for sale on Apple’s online store. Apple announced a new, $199 iPod Touch model with 16GB of internal storage Thursday morning. Previously, the low-end iPod Touch cost $230, and unlike the current (fifth-generation) iPod Touch lineup, the low-end model lacked a rear camera and only came in two colors, black and silver. It was a bit of an odd duck. The new model comes in all five colors and has a rear camera — it is the same as the current generation 32GB and 64GB models, but with less storage space and a little bit cheaper. The other two iPod Touch models in the fifth-generation lineup also got price cuts: the 32GB model now costs $250, as opposed to $300, and the 64GB model got a full $100 cut down to $300. As 9to5Mac’s Seth Weintraub points out, this is the first time that Apple’s broken from its traditional $100 charge to double storage on an iOS device. For instance, on a two-year contract, a 16GB iPhone costs $200, and to bump up to 32GB would be $100 more. This iPod Touch price cut breaks from that model. Combined with recent rumors that Apple might be planning to use 128GB storage space as a featured differentiator for the larger iPhone supposedly coming out this fall, and that the newest iPhone could start at 32GB of internal storage at minimum, it does appear that Apple might be planning to reevaluate its iOS internal storage pricing. Although there is no natural Android competitor to the iPod touch, recently, low-end phones like the Moto G and Moto E have started offering similar feature sets at competitive prices, in addition to the capability to add phone service. The iPod Touch last got a redesign in October 2012. How about a 128GB touch? Exactly what I just did. Bought two Verizon Moto Gs for $69 (was $50 at Best Buy last week) and turned off the cell function (un-activated). They work perfectly as a full fledged WiFi smart device. They can stream music, play local music, play games, text, etc! The screens are actually much nicer than I thought they would be.